Five years after inciting a new cycling revolution, British trike maker KMX Karts, Ltd. will unleash seven new models on the U.S. market in January 2008. The KMX line-up of sports and performance trikesto be rolled out at Interbike Booth 6613builds on the rugged, inspired design that won thumbs up from KMX's original thrill-seeking converts. The new models ratchet up the fun factor of the originals with improved engineering and higher end components, offering superior value with increased quality and performance. Over-sized super glide pulleys for smooth chain management. 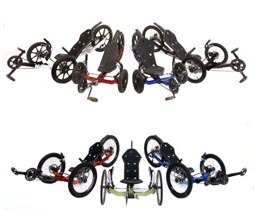 Three adult performance modelsthe Cobra, Viper and the top-of-the-line Venom, which is the first recumbent equipped with racing bike road components. (KMX had to get permission from SRAM for this distinctive outfitting.) A fast, robust trike, Venom is the only road-specific member of KMX's new fleet. The other KMXs, like their predecessors, are as much at home off-road as on. The 2008 model web site, www.kmxus.com, will be launched in December 2007. Until then, to learn more about the new line of KMX trikes contact Dave Faulkner, Manager, KMX America, at info@kmxus.com or 1-866-299-8473.